The look of a low profile mitt, yet toasty warm like an oven. -Softshell + NTX Nylon chassis flex and protect. -170g Primaloft insulation is like throwing on that down comforter and settling in. -Debossed SureGrip palm serves you right on two fronts...water resistance and grip! -Hipora membrane keeps the wet out and warm in! -Soft brushed lining lays on your hand like a baby llama. 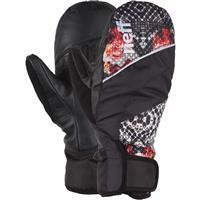 -Removable wrist leashes to keep your mitts from escaping.